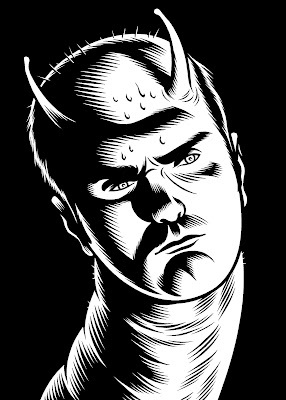 Charles Burns is amazing. I knew his work...just didnt know his name. So, as I was reading the new McSweeney's magazine, The Believer, this morning, I was rapturous about the wonderful portraits on the cover and had to find out who the big talent was who does these intense portraits chock full of tiger stripes and elegant line work. From that came the discovery that Charles Burns is the very man. My looking about (noted by the links below) took me to the world of Charles Burns, author, illustrator, entrepeneur and his art. He is the illustrator of choice for the Believer (along with cover, a great tee shirt, a poster of faces etc--see their store). He is an inspiration in his work, the breadth of his talent and the "wierdness" that is often cited in the articles on him. I dont think he is "wierd"-- I think he is someone to study and watch. He has the handle on something distinct and real. This included his Black Hole publication.